How to use Mail Forwarder? E-mail (electronic mail) is the information stored on a computer that is exchanged between two users over by telecommunication. electronic mail are usually compression in ASCII text. However, you can also send nonentity files, such as graphic images and sound files, as attachments sent in binary strait. electronic mail was one of the first apply of the Internet and is stock-still the popular use. To redirect mail addressed from one location to another address we need to use Mail Forwarder in Email Hosting. Through mail forwaders automatically forward/ route all the incoming emails to one email account to another chosen destination email account. How to set Mail Forwarders? To set Mail Forwarder you need to follow below steps. Step 1: In Email Hosting login to cpanel=> Click on Forwarders option under EMAIL section. 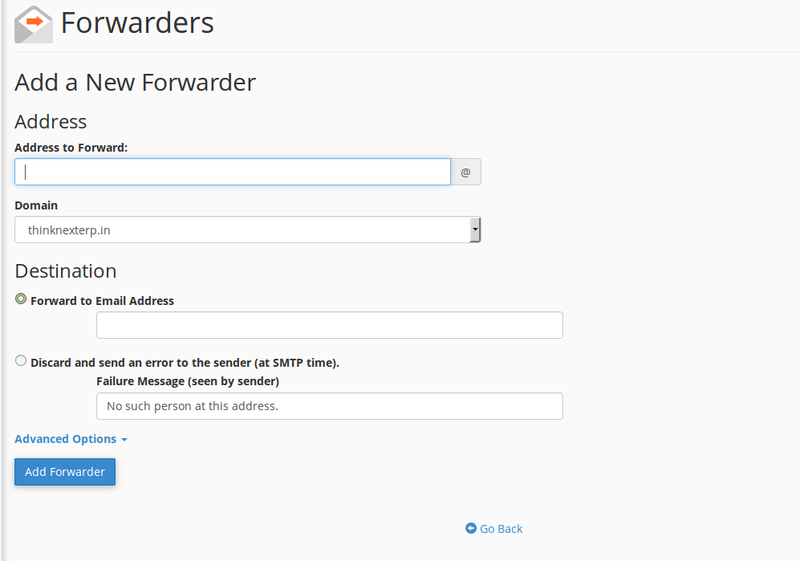 Step 2: Once you will Click on Forwarders you have to click Add Forwarder. Steps 3: In this section you have to provide the email address from which email address to which email address you want to set the forwarders and mention the domain name for which mail id has been created and select the Forward to Email address option. Steps 4: Once it will be done click on Add forwarder. Get the best email hosting for your website from HostingRaja at an affordable price and also with amazing features. With our Email hosting, we help your business to create a brand recognition. Not only that we also provide good Security, Anytime and Anywhere Access, Cost Effectiveness with our Email hosting. Get your Email hosting from India's # best Web hosting company India. How to login to server?